Assuming you have installed and activated the plugin now it is time to configure the plugin. The plugin configuration page has only two options as shown in the below screen shot. The plugin also adds Visual Editor button which we will discuss later in this article. The first option should be left blank if you have installed WordPress in root directory. This is the generic case. In case you have installed WordPress in sub directory of your root directory then mention the sub directory name in the first option. You should mention the sub directory name without any trailing slashes (/). You have to mention your Image directory or folder name in second option. For example if you create images directory in root directory of WordPress installation then mention enter images here. The folder name should be mentioned without any trailing slashes (/). If you have created the folder in uploads directory then enter name of the folder without any trailing slashes (/) (wp-content/uploads/images) . You can also use any existing directory as well. After entering above two options you can Save the Options. After the plugin is installed and activated you can see a new Visual Editor button. This visual editor button enables you to add Galleries to your WordPress posts and pages. Once you click on Visual Editor you will see pop up with below options. You can select between different Gallery types plugin support. You can have File Name as Caption text or Sub folder name as caption text or can disable it all together. Your file name and sub folder name is also used for ALT text generation. So you should use meaningful sub folder name and file name for better Image SEO. Currently the plugin supports 8 animation types. You can select any for your Gallery from this drop down. Currently the plugin supports 10 effects. You can select any for your Gallery from this drop down. How to create your first Gallery? Create a folder inside your WordPress installation. You can create it any where but I would recommend creating it in either root folder or uploads directory. This folder will have all the sub folders. 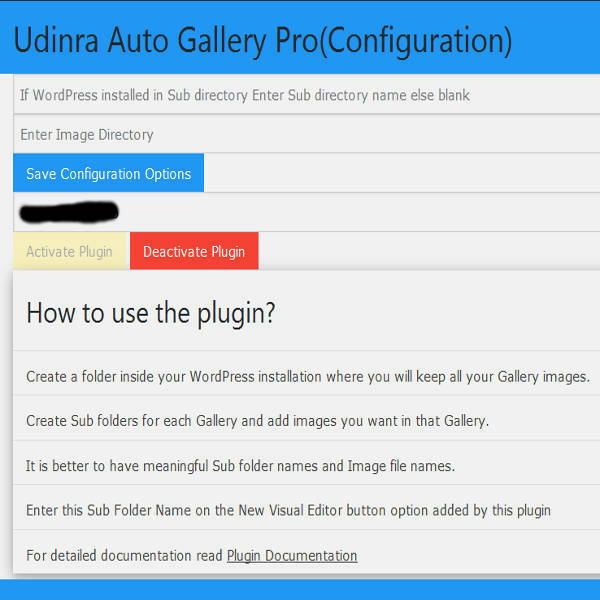 For example lets assume you have created folder images in root directory of your WordPress installation.On the plugin configuration page the option Enter Image Directory will be images. Now that you have created folder to contain all of your images. In this step create a sub folder inside the folder you created in step 1. Lets assume you have created sub folder Cats inside the Images folder mentioned in step 1. You can create as many sub folders you want. For every sub folder you can have one Gallery. Now add all images to the sub folder you want under the Gallery Cats . You can do so with FTP or any other process. You need to directly upload the images there. 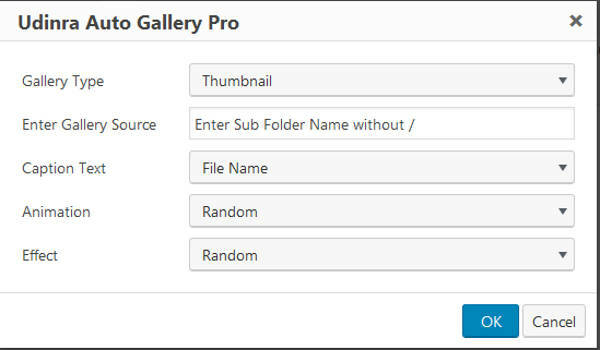 Now log into your WordPress dashboard and open the post in which you want to place the Gallery. Auto Gallery plugin adds a Visual Editor button. Use the button to add the Gallery in the post or page. For example on the Visual Editor button pop you will have to Cats in the option Enter Gallery Source. The Enter Gallery Source will be same as Sub folder name. Your Gallery should be live now. For any change in Gallery in future you just have to add or delete or replace images in the sub folder. There is no action from WordPress dashboard. There is no limit on number of sub folders or number of images you can have in a Gallery.